Our professional concrete driveway staining in Lomita CA can make your driveway a work of art. Whether you’re talking about a residential or a commercial property, the driveway is probably your primary access point, and it will affect people’s impression of the property. You certainly don’t want a plain, utilitarian concrete driveway detracting from the upscale appearance of your home or business. Make sure your driveway is an asset, not a liability, by coloring it with concrete driveway staining in Lomita CA. Beautiful: With concrete driveway staining in Lomita CA, you can imbue plain, boring concrete with rich, deep, dimensional color. We use water-based stains to give you a full spectrum of hues to choose from. By combining or layering stains, you can create a variegated look that will add even more interest to your driveway. Durable: At Fuller Concrete Staining, we use commercial-grade products that are made to last. Concrete stain is not a surface coating, so it won’t chip, flake, or peel. It is also UV stable to prevent unsightly fading. Quick: Most of the time, making a dramatic impact on the appearance of your home or business is a major undertaking lasting weeks or months. Concrete driveway staining in Lomita CA can typically be completed in just two days, giving you maximum impact for minimal time investment. Cost-Effective: Concrete driveway staining in Lomita CA is a particularly good investment when you’re dealing with an old, discolored driveway. With the right combination of stains, you can cover many types of imperfections at a fraction of the cost of pouring new concrete. You can also create the look of expensive materials like stone or tile without breaking your budget. 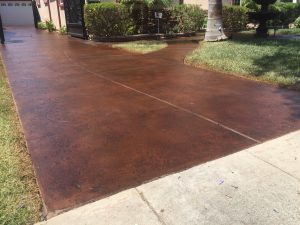 Although you can find products for DIY concrete driveway staining in Lomita CA at your local home improvement store, for best results you really do need to hire a professional.Fuller Concrete Staining specializes in transforming driveways with stain, and we’ve mastered all the best techniques for this process. We will work hard to help you realize your design vision, and the quality of our work is always guaranteed.